Special Note: Route is ALL Jeep road, though it is a very scenic area. 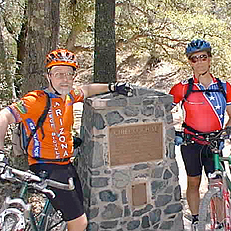 Mark and Dan at the Stronghold Campground. 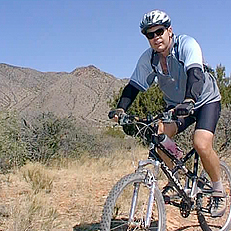 This ride is located in the Coronado National Forest east of Tucson. Frankly, it’s quite a drive from Tucson and it is completely on Jeep road. That being said, if you’re in the area and are itching to hear the crunch of gravel under your knobby tires, it is a very beautiful area. 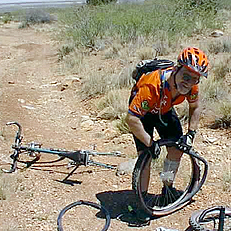 The road is VERY fast in spots, but that also means hard climbing in those same spots. You can get water at the Stronghold, it’s a nice historic area, and it is very pretty inside the canyon.